I am part of this beautiful Summer show at Visual Voice in Truro. I stopped this past Wednesday to see the show in person. It's lovely, colorful and fun. I definitely recommend everyone to stop in and visit Nuri and this great collection of works. 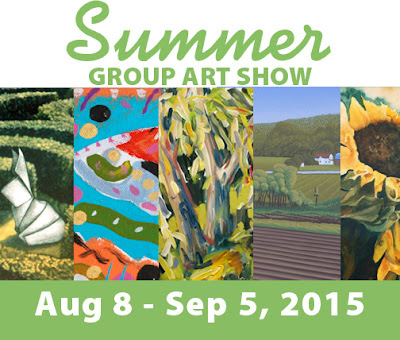 "Visual Voice Fine Art presents its annual 'Summer' Show, a new group art exhibit around sun, flowers, fish, green fields, and all things summery. Featuring the distinct styles of artists: Kath Kornelsen, Tae Hee Kim, Ian Stainwright, Carol Morrison, Maria Doering, Ellen Moershel, Judy Arsenault, Leya Evelyn, Eliza Schurman, Judith J. Leidl, Rosa Carr, Kristiina Lehtonen, and Robert Rutherford. A wide range of media will be on display: oil and acrylic painting, screenprint and linocut, encaustic and mixed media, sculpture and more. A happy mismatch, a collage of styles and media, with a sunny disposition. Drop by the Visual Voice Fine Art gallery in downtown Truro from August 8 to September 5 and enjoy summer in more ways than one. The gallery is always free to attend."